The Crusades refer to a series of military expeditions over several centuries, beginning with the First Crusade in 1096 through the end of the Fifth Crusade in 1221, and continuing on is more sporadic fashion up until the Reformation. The term Crusade is not a medieval word. It is a modern word. It comes from crucesignati ["those signed by the cross"], a term used occasionally after the twelfth century to refer to what we now call "crusades." Contrary to popular opinion, the Crusades did not begin as a holy war whose mission was to convert the heathen by the sword. In fact, very few of the crusades saw their mission as an evangelistic one. The initial purpose of the Crusades, and the main military goal throughout the Middle Ages, was quite simply to reclaim Christian lands captured by Muslim armies. The popular conception of ignorant, cruel, and superstitious crusaders attacking peaceful, sophisticated Muslims comes largely from Sir Walter Scott's novel, The Talisman  and Sir Steven Runciman's three volume History of the Crusades [1951-54], the latter of which concludes with the famous summation now shared by most everyone: "the Holy War itself was nothing more than a long act of intolerance in the name of God, which is the sin against the Holy Ghost." Scott and Runciman did much to shape the popular and entirely negative view of the Crusades, but it isn't as if they had no material to work with. The Crusades were often barbaric and often produced spectacular failures - all in the name of Jesus. Children died needlessly. Coalitions splintered endlessly. Jews were sometimes persecuted mercilessly. Ancient cities were ransacked foolishly. And on occasion [e.g., the Wendish Crusade] infidels were forced to convert or die, while the crusaders holding the swords were guaranteed immortality. In short, many of the Christians who went to war under the sign of the cross conducted themselves as if they knew nothing of the Christ of the cross. But that's not the whole story. 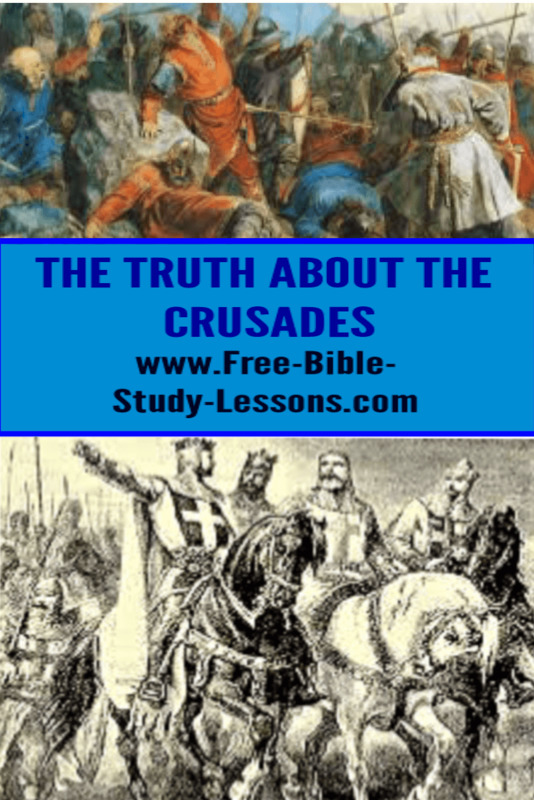 The Crusades is also the story of thousands of godly men, women, and children who sacrificed time, money, and health to reclaim holy lands in distant countries overrun by Muslims. The Christians of the East had suffered mightily at the hands of the Turks and Arabs. It was only right, it seemed to medieval Christians, to go and help their fellow Christians and reclaim their land and property. Many crusaders were knights who, with their families, left lands and titles. They saw their journey to the Middle East as an act of piety, a pilgrimage to Jerusalem, the center of the earth and the center of their spiritual world. To be sure, the crusaders could be arrogant and savage, but they could also be pious, compassionate [e.g., the Hospitallers], and courageous. We are right to deplore the cruelty meted out by crusading Christians, but we should not ignore their plight. Christians lands had been captured. Surely, they thought, this could not stand. For an American, it's as if Al-Qaeda sacked Washington D.C., set up shop for bin Laden in the White House, and turned the Lincoln Memorial into a terrorist training center. It would be unthinkable, not to mention cowardly, for no one to storm the city, liberate its captives, and reclaim our nation's capital. We should never excuse the atrocities that occurred under the banner of the cross during the Crusades, but we should, at least, take pause to understand why they set out on what seems to us to be a fool's errand. We should...resist the temptation to blame present-day Muslim extremism on the Crusades. This is not to say that the Crusades don't loom large in the Islamic consciousness. It is to say that this was not always the case. The Crusades were always a big deal in the Christian West, but for Muslims, as late as the seventeenth century, it was just another futile attempt by the infidels to halt the inevitable expansion of Islam. From the time of the prophet Muhammad through the Reformation, Muslims conquered three-fourths of Christian lands. Once the Muslims united under Saladin, the crusaders, themselves divided, were no match for the armies of Islam. The Crusades were not a major factor in shaping the Islamic world. The term for the Crusades, harb-al-salib, was only introduced in the Arab language in the mid-nineteenth century, and the first Arabic history of the Crusades was not written until 1899. Because the Crusades were unsuccessful, they simply did not matter much to Muslims. But all this began to change when European nations colonized Muslim nations and brought their schools and textbooks which hailed the gallant crusaders and heroic knights who tried to bring Christianity and civilization to the Middle East. Like sports, like war, like life - when you're winning, you don't care who's losing; but when you're losing, it matters a lot who's beating you. “Whenever there is a political problem involving Christians, irrespective of whether the issue regards a political party, or a political or religious authority, the Crusades are dusted off and used to defame, discredit and damage them. But the reality is that the Middle Eastern Crusades were not Christian attempts at proselytising the region. They were expansionist campaigns, carried out by the West under the banner of the cross, with the aim of liberating Jerusalem from the Muslims. This is demonstrated by the fact that the first victims of the campaigns were the faithful of the Eastern Churches and the Jews, from Constantinople to Jerusalem itself. The Crusaders destroyed churches, killed monks and priests, and burned Christian towns and villages inhabited by peaceful people. The former Coptic Pope, Shenouda, once mentioned to me that the Coptic Church has canonised some nuns who were killed by the Crusaders. Arab historians soon realised how things really stood, defining these expeditions as “Frankish campaigns”. They knew that Eastern Christians were as much victims of these campaigns as Muslims were. “Similarly, whenever a crisis erupts in relations between the Arabs and the United States, or any European country, Arab Christians are accused of being a fifth column of the Western enemy against Muslims and Arabs. The origin of this error, or rather, this sin, lies in the confusion that is generated in the minds of Islamic extremists between the notions of the West and Christianity. This leads them to assume that Eastern Christianity is simply an extension of the West, its spearhead, or that Eastern Christians are the remnants of the Conqueror Crusaders.